BPSC has stretched the last date for submission of application for 60-62 Common Combined Competitive Examination. Interested candidates, who haven’t applied yet, can now check the eligibility criteria and apply till 05 December at bpsc.bih.nic.in. Candidates are hereby informed that Bihar PSC had notified of the 60-62 Common Combined Competitive Exam on 15 September and last date was till 10 November. However the Commission has extended the last date till 05 December. Candidates should also note that the application fee can be deposited till 30 November. 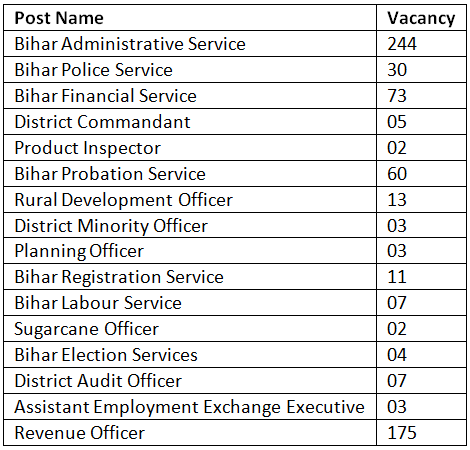 The Commission will conduct the exam for selecting candidates for recruitment to 642 posts under Bihar Administrative Services, Bihar Police Services, Bihar Financial Services, Bihar Probation Service, and other associated departments by 10 November 2016. Candidates, who missed on the opportunity to apply for the 642 vacancies through BPSC60-62 Common Combined Competitive Examination under various departments before the previous last date of application, now have another chance to apply for BPSC 60-62 Common Combined Competitive Examination. Candidates possessing a Graduation degree or equivalent from a University are eligible to apply for the mentioned posts through BPSC 60-62 Common Combined Competitive Examination. About BPSC Combined Competitive Exam: Bihar Public Service Commission is one of the biggest functioning bodies in the State. The Commission is involved in selecting and recruiting fresher talents every year in the administrative sector of the State. Bihar Public Service Commission (BPSC) invited online applications for BPSC 60, 61st and 62nd BPSC Common Combined Competitive Examination 2016, for recruitment to the various posts under Bihar Administrative Services, Bihar Police Services, Bihar Financial Services, Bihar Probation Service, and other associated departments. Changes have been announced by the Commission regarding the application submission. Candidates can now apply till 05 December (fees can be deposited till 30 November).